The ALS Association is recognized as exempt from federal income tax under section 501 (c) (3) of the Internal Revenue Code and is registered under statutory laws throughout the United States. 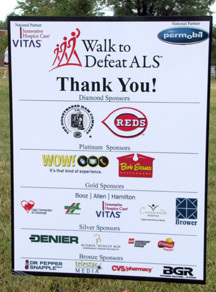 A broad range of corporations and private foundations support The ALS Association St. Louis Regional Chapter’s patient and family programs, advocacy and national research projects through cash and in-kind contributions. To learn how your organization can invest in The ALS Association St. Louis Regional Chapter, please contact Maureen Barber-Hill at (314)432-7257. Prosser's Moving & Storage Co.